Alykes is a tourist town on the western coast of the island 18 kms from the city of Zakynthos. 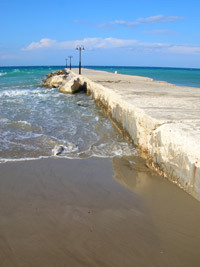 It is very peculiar for the presence of salterns that supply salt to the entire island and from where the town derives its name (Alykes in Greek literally means saltern), it was conceived as a tourist town with hotels, rooms for rent, restaurants, pubs and every infrastructure and tourist service. In addition to salterns there is a small river diving in the sea on which some bridges were built to reach the town centre. Alykes position is excellent for the tourist who likes moving, during his holidays, since the attractions in the north like Shipwreck and the Blue Caves or the southern towns of Tsivilì and Zakynthos that are very close along the main island road. 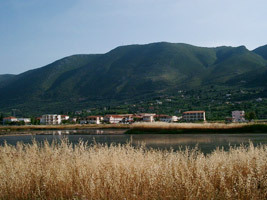 The town located in a plain a little before the mountains chain that divides the island in two parts, favours activities such as trips in mountain bike and runs in the greenness. The extension of Alykes is the town of Alykanas; it is difficult to understand where one is finishing and the other beginning especially if you walk along the sandy beach that unites them. The beach of Alykes embraces a very wide gulf that looks like a very long tract of fine sand. The bay is very good to sunbathe in complete relax and being equipped with tourist facilities it can make happy also the ones who love “active” holidays that here can enjoy water sports and snack bars. 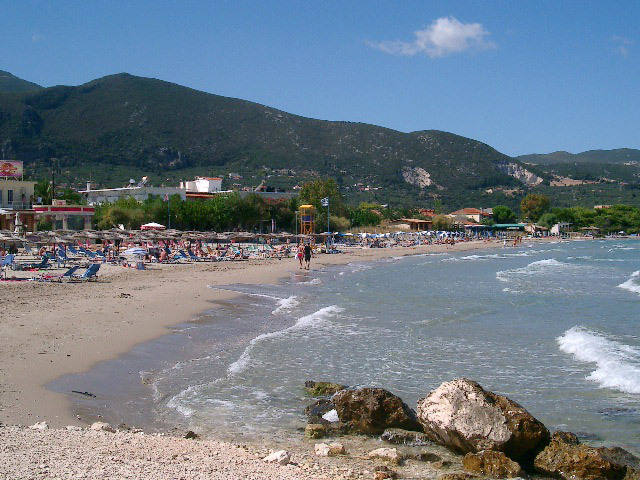 The beach of Alikanas is a continuation of Alykes beach but it is much deeper in the final part. Alykes and Alikanas are connected to Zakynthos by bus with daily runs. Furthermore it possible to rent cars, jeeps, motorbikes or bicycles to move around the island. In Alykes and Alikanas there are many shops of every kind: supermarkets, cake shops, souvenir shops, jewellers and many others. During the day along the beach there are water sports whereas at night, after dinner in one of the many typical taverns with international cuisine or fast food, it is possible to have a drink in one of the many pubs that play every sort of music. Alykes and Alikanas together become an big town offering different accommodation such as hotels, apartments, studios, villas and also a small camping.